PORT-AU-PRINCE (The Miami Herald)— Haitians said farewell Saturday to former President-for-life Jean-Claude “Baby Doc” Duvalier in a simple Catholic Mass that had no official State presence except for a blue and red Haitian flag that draped his coffin. The flag was reintroduced after the fall of Duvalier on Feb. 7, 1986 — and has come to symbolize anti-Duvalierism. The flag used by the Duvalier regime during its 29-year father-and-son rule was red and black. Haitian President Michel Martelly nor Prime Minister Laurent Lamothe attended, neither did members of the foreign diplomatic corps. But there were former cabinet members of Duvalier’s government, some of whom either currently hold or held posts in Martelly’s government. Those who crowded the church remembered him as a leader who brought law and order to an impoverished Haiti. Roman Catholic Priest Occide “Père Sicot” Jean remembered him as a supporter of Haitian farmers. 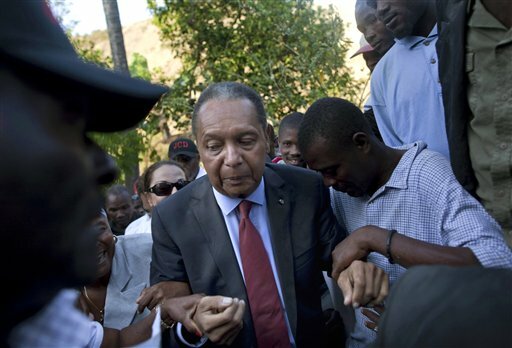 Outside the church, however, Duvalier was being judged and remembered not as a supporter of Haitians but as an iron-fisted dictator with blood on his hands. Dozens of demonstrators — mostly the young offspring of his victims who were either killed, jailed, tortured, disappeared or forced into exile during his 15-year reign — held a sit-in in front the Citizens Protection Office, a government agency that is supposed to register grievances.